The course main topic is biomechanical assessment as an important tool for PRM Physicians. 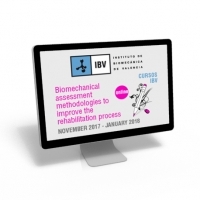 The cost of the course is 247.93 + VAT (Total 300 €) and the IBV has generated a discount coupon for 5% of the basic amount for those students who come from ESPRM (ESPRM4R2018). The platfom mannagers are experts from the Biomechanics Institute of Valencia (IBV) and Politecnico Di Milano Institute (POLIMI) will also cooperate in the teaching.